CHRISTOPH ZUERCHER, Graduate School of Public and International Affairs, University of Ottawa. Moderated by STEPHEN BARANYI, School of International Development and Globalization Studies, University of Ottawa. This event will mark the publication of Costly Democracy: Peacebuilding and Democratization After War. The book offers comparative analyses of recent cases of peacebuilding to explain why peacebuilding missions often bring peace, but seldom democracy, to war-torn countries. It makes the case that the preferences of domestic elites are greatly shaped by the costs they incur in adopting democracy, as well as the leverage that peacebuilders wield to increase the costs of non-adoption. 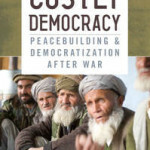 As cases from Afghanistan, Bosnia, Kosovo, Timor, Rwanda, Namibia, Mozambique, and Tajikistan show, domestic elites in postwar societies may desire the resources—both material and symbolic—that peacebuilders can bring, but they are less eager to adopt democracy because they believe democratic reforms may endanger some or all of their substantive interests. Christoph Zuercher is a professor at the Graduate School of Public and International Affairs at the University of Ottawa, and one of the coordinators of the uOttawa-based Fragile States Research Network. His research and teaching interests include conflict research, methods of conflict research, state-building and intervention, international governance and development. His regional focus is on the former Soviet Union, especially on Russia, the Caucasus, and Central Asia including Afghanistan.